By the middle of June, the NEW Eagle Mascot Illustration will be presented to the Newtown Totem children, volunteers and their school! 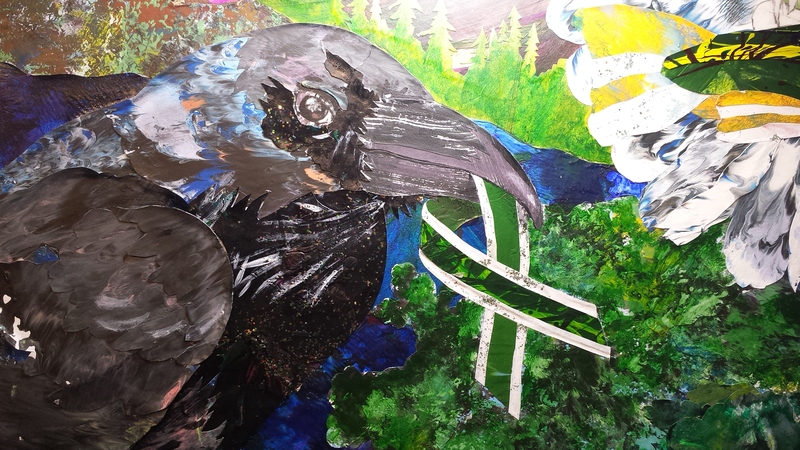 Here is a glimpse of the Raven design, one of six creatures art directed, and paper art designed by the workshop children and volunteers. Stay tuned for the full presentation after the illustration unveiling! Young Art Directors Gives Inspiration to Eagle Mascot Illustration! Here is the working comp that was created from the sketch. 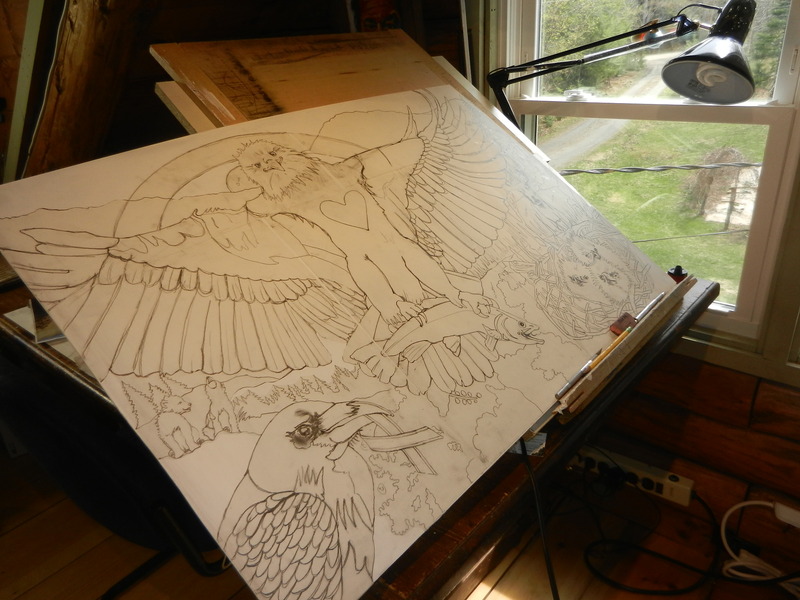 Inspired by the Newtown Totems young art directors, Kristina is working hard in the creation of their new Eagle Mascot. The final step is papering in all the children’s paper art from the workshop. In June the final illustration will be presented and given to the school. Later it will be shared on this website. Additionally, a book will be created of the children’s animal totem illustration stories. 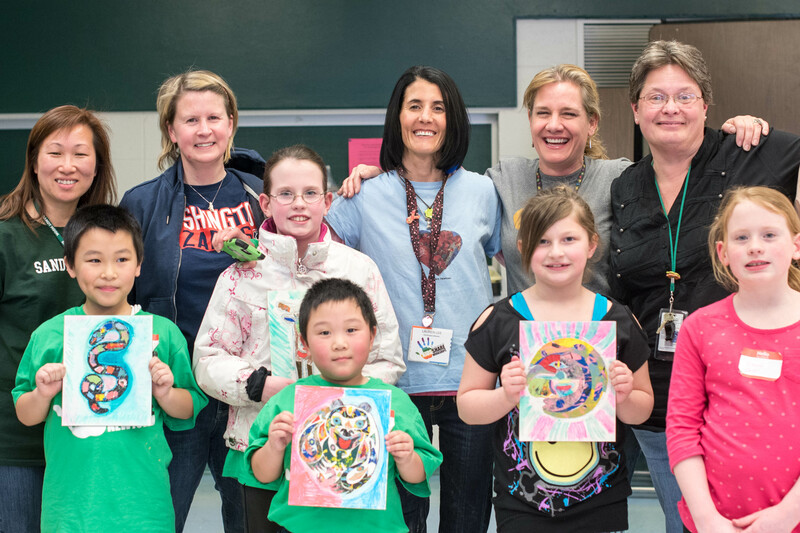 Kids Share Workshops functions effectively with a team of compassionate volunteers. Adults from all backgrounds add richness to the workshop environment. Community teachers and administrators help tremendously in getting the word out about our afterschool program and encouraged to join us. Lauren Lee for helping to construct, and edit the new Kids Share Curriculum, volunteer teaching as an educator, seasoned KSW teacher and board member. John Lee for his passionate presentation, and teaching of the Native American culture, volunteer teaching as an administrator, and KSW board president. Kathy Gramolini seasoned fourth grade teacher volunteer, and excellent storytime reader who masterfully kept the children focused. Tim Napolitano, principal who coordinated with Kristina, opened his school, facilitated the space, and connections to help make Kids Share Newtown Totems a reality. Mai Wong parent volunteer who arrived before others to help set up, and baked outstanding treats as a snack fairy. Beth Hegarty parent volunteer, KSW board member, who also arrived early to help set up, brought humorous wit, snack fairy, and ensuring children stayed focused with her eagle vision, and helped to donate the leftover KSW paint to Resiliency Center of Newtown. Kristen Marshall parent volunteer, KSW board member, snack fairy, who graciously stored KSW material in her barn for two years. Brenda Berta KSW board member, snack fairy, volunteer teacher, and excellent at connecting others with her savvy business sense. Kate Montague new KSW photographer with an excellent eye for canine and children portraiture who brought chocolate Easter bunnies for all the children, and connected us with, Betsy Ingram Gancarz new KSW photographer excellent eye for capturing children’s expressions and intimate moments. Kathy Chattoraj is new to KSW as a volunteer she is a professional artist and teacher for Pinot’s Palette in Stamford, CT.
Melissa and Mike Mathison kindly gave Kristina, founder excellent accommodations while teaching in Newtown. Additional Thank You to: Parents who were snack fairies. We were all more than well fed and energized to create. Thank you school custodians for graciously allowing us to store our Kids Share material in your office, assisting with the elevator, clean up and cart needs. Welcome to our first paper art, totem workshop! We are excited to be getting ready for a new Workshop, March 30, 31, April 1, 2, 2015 held in western Connecticut. 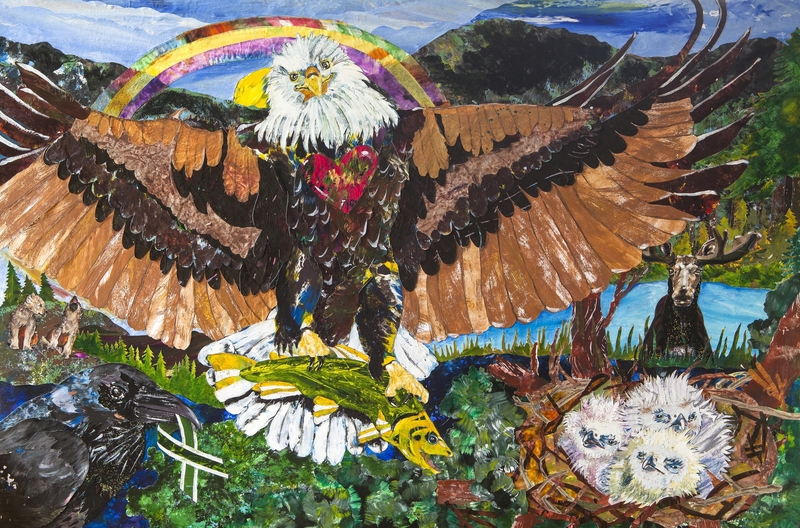 Following the workshop the artist in residence will return 1-2 months later with the co-created, art directed by children, Eagle Mascot illustration to be given to the school. This will be our first workshop where we will not name the school or children’s first names. For example: Each child photographed and shared on this website will be called by their totem name, based on their zodiac totem sign. Please join us on this exciting journey! Workshops are funded by; grants, foundations, donations, and fundraising merchandise. Thank you for your support. *Please enjoy this relaxing sounds of Tibetan Singing Bowls as we transition into Springtime. *Special note: The designs here are recreations from other artists interpretations of North American totem art. There are no copyrights on these designs. 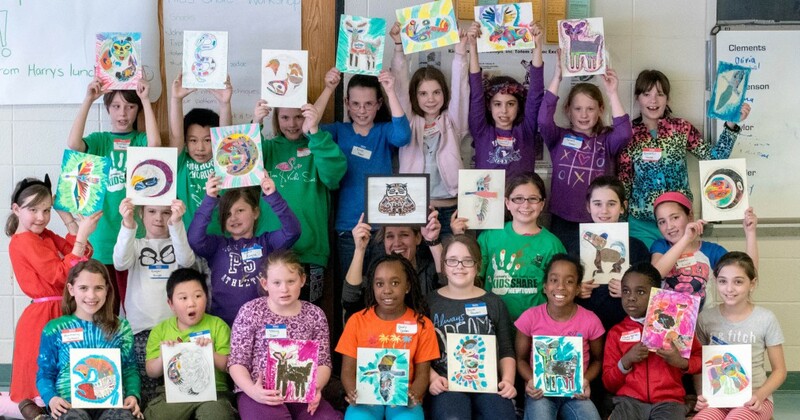 Our goal is to engage children in learning more about the North American arts and culture.